Was held a Press Conference at CRT (Comité Regional Du Tourisme - Regional Tourism Committee) Headquarters in Paris, with Valérie PECRESSE (President of the Paris Region), Hamida REZEG (Vice-President in charge of Tourism) and Eric JEUNEMAITRE (President of CTR). The Theme on that Day was the "2018 Ile-De-France Balance Of Tourism". The Previous Mass and Unprecedented Deployment of Initiatives in Paris and Ile-de-France shows that Tourism Professionals, who are committed to this Regional System, are aware that the Quality of Hospitality is a Strategic Issue for the World's Leading Tourist Destination. The Challenge for the Destination is Clear: to welcome Visitors to win their Loyalty and encourage their Return. For Several Years the Destination “Paris Region” has been the most visited Tourist Region in the World. Widely Popular for the Diversity of its Natural, Heritage and Cultural Wealth, the Destination offers Visitors of all ages, from near and far, a Wide Choice of Holidays. The Principal Region for French Art Of Living, it promotes the Influence of the Cultural Values for which FRANCE is Internationally Famous. 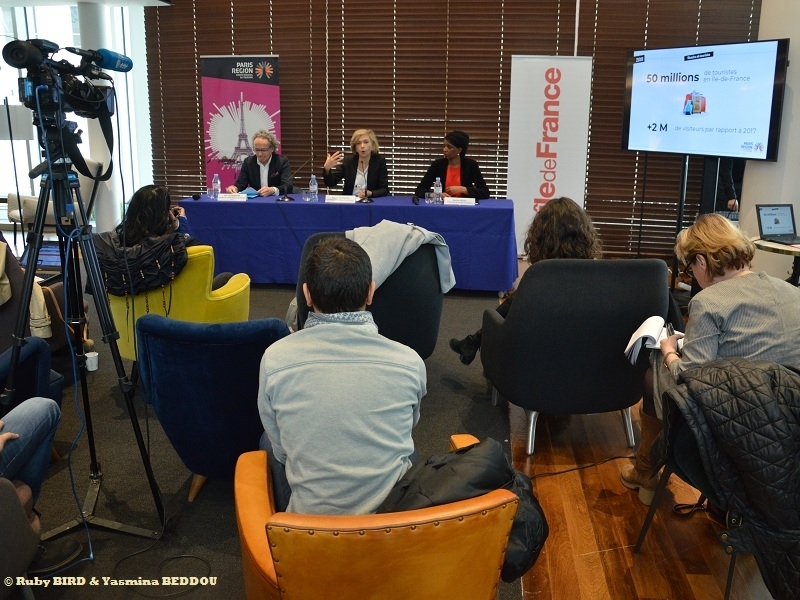 * Projections 2024 with Perceptions of Tourism by Ile-de-France Residents : 52% consider the Impact of Tourism more Positive than Negative - 77% agree with the Fact to promote Ile-de-France Destination help to attract Tourists - 3% are "Tourismophobes"
Source : Press Conference given at CRT Headquarters in Paris - February 14, 2019 with Valérie PECRESSE, Hamida REZEG and Eric JEUNEMAITRE.